Learning spaces need to invoke creativity, inspiration, and a space to continuously collaborate with one’s peers. Transform your classroom learning space and incorporate creative and mobile workflow design elements- to inspire student learning by participating in SLATE’s Coding and Makerspace Playground!!! Naomi Harm and a team of WI edtech teachers and administrators will share their computer science learning adventures when it comes to everything from tinkering, to making, to coding to creating through10 hands-on unique learning stations. 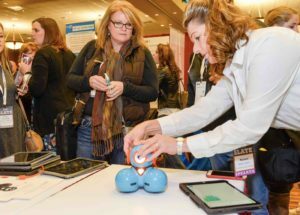 These learning experiences will open up the doorway of opportunity for you and your students with a focus on AR/VR experiences and creation tools, video game design, variety of robotics and coding activities, 3D printers and design creations, AI chatbot introductions and take and make options, and variety of non-tech Makerspace creation activities. You will leave with a treasure trove of learning ideas to transform your classroom environment into a dynamic collaborative learning hub.